Despite being such a frequently-used pen, I have never delved into the details about it. A quick search on Google brought me to Cult Pens, which gave a very short description about it. It was first launched in 1983 (wow, that is way before I even existed in this world!) and it is a needle-point rollerball. Cool, I didn’t know needle-pointed pens are rollerball pens. I always called them “ink pen”. Now I wonder why that term came out. Probably because before the use of rollerballs became popular, everyone in school used ballpoint pens. 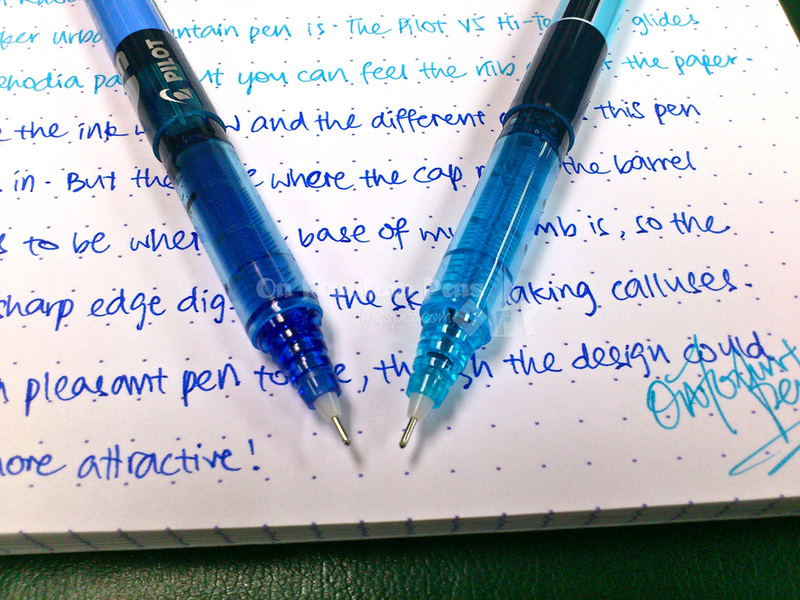 So when these needle points increased in popularity, everyone just grabbed one and probably called it the “ink pen” due to the smooth, consistent inky flow. I don’t know why the picture came out not so nice. It looked totally perfect on my phone’s camera, but when I transferred the file to my Macbook, the colours aren’t so striking. 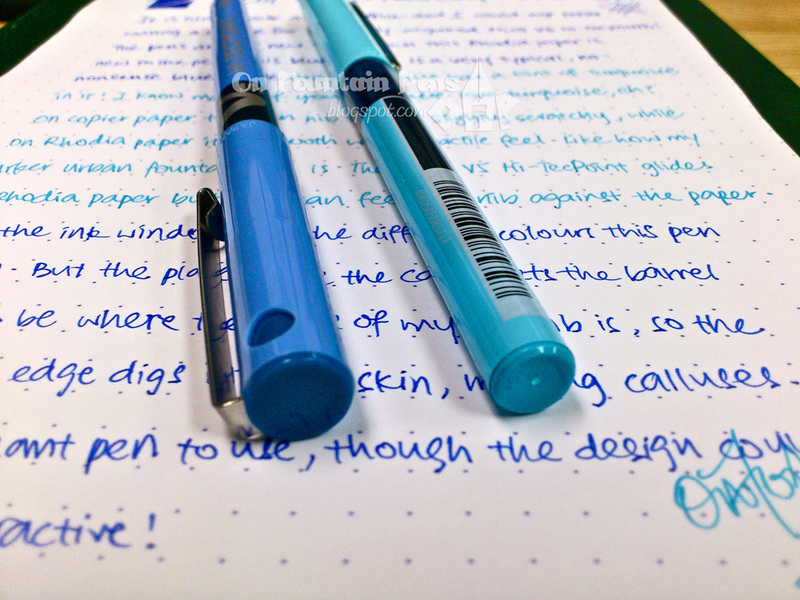 The blue 0.5mm one has a nice cheerful blue. To me, it is a very “Hey there, look at me and I take no nonsense” kind of blue. The light blue seems almost turquoise. Almost. But not quite. The colours of the inks remind me of the Pilot Super Gel’s colours – bright, interesting and captivating. All of them are no-nonsense colours. You just can’t fight with them saying “the blue looks more like a purple to me”, because they are just… so… typical. “Typical” may not always be seen as a positive word, but in this case it is a good thing. I really love Pilot for letting their pens drink inks of such beautiful colours! Despite being a 0.5mm tip, it writes rather fine and I would put it more as a 0.4mm tip – like the Fine nib of Japanese fountain pens. The ink flowing out is saturated and dries fast on paper too – a bonus point for lefties like me, who won’t have to be worried about smudging while scribbling notes fast! The two pens measure 13.6cm capped and 15cm posted. That’s not such a bad length for a pen. The diameter of the pen barrel is 0.9cm, so you can have a rough idea of the pen thickness. It’s strange, because I always thought that the Pilot V5 hi-tecpoint was fatter. Did they shrink in size of did my hands grow bigger? If you ask me, I really think it’s my own illusion. The pens didn’t seem to have changed much over the years. Still the good old trusty ones! 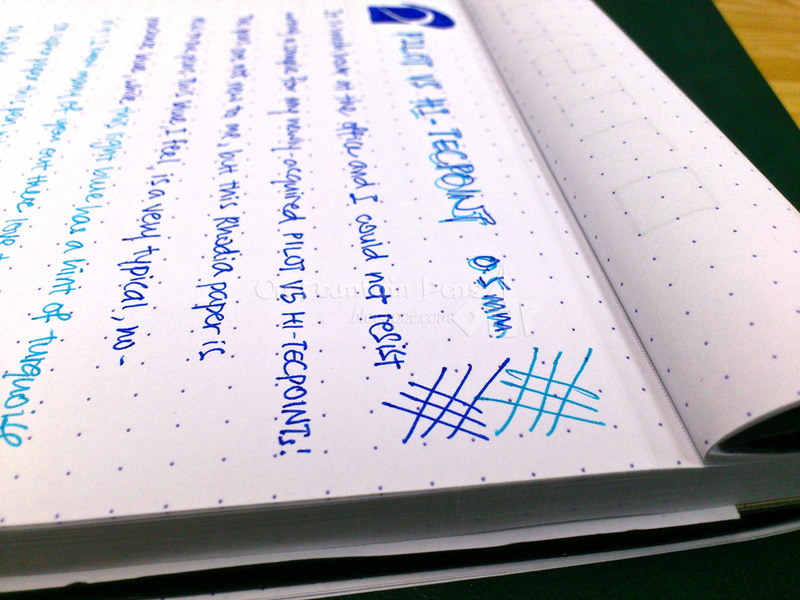 What I like about the pen is not only the ink flow, but also the ink window at the side. Looking at the above picture, do you see a dark rectangular box on the pen barrel? That is the ink window. I loved saying hi to the ink and watch it slosh around inside the pen. And come to think of it – one improvement made to the design which I have just noticed is the additional dark section that joins the barrel to the cap. Previously I don’t remember having such a part. This second window allows you to continue monitoring the ink level when it is reaching low. That is a thoughtful improvement! It’s just too bad I don’t have one of the older designs to compare with. Now there is only one thing left to improve: a way to REFILL the pen. I would love to use this pen in all my other ink formulas, but there is no way to refill the ink! Please let me know if there is a hack to this! As you may know, I don’t usually review clips, but this is one clip I would like to briefly talk about. Let me talk about the negative aspect, which is really such a small issue that you won’t even find it necessary to mention. They are metal, so they bend. I have used V5’s before with slightly bent clips, probably from intensive use (clipping too many papers at once?). For these new pens, I’m not sure this is improved. But there is also a plus point about the clips: they are made of metal, thus will not break off the cap like those plastic ones! The clips spring back to position when I flick them, and they seem pretty sturdy too! Now an important aspect: the nib. Is it smooth? Yes. Any ink flow problems? None so far. Although I may get some skips when gunk gets stuck on the nib. Speaking of which, these needle points seem to be dust-a-philic. Dust seems to be attracted to them. These pens need some constant care and cleaning to keep them perfect for use. I found a mini surprise about this pen on paper. On normal copier paper, the pen is nice and smooth, with a slightly tactile feel like the Stabilo pointVisco that I reviewed a couple of days ago. 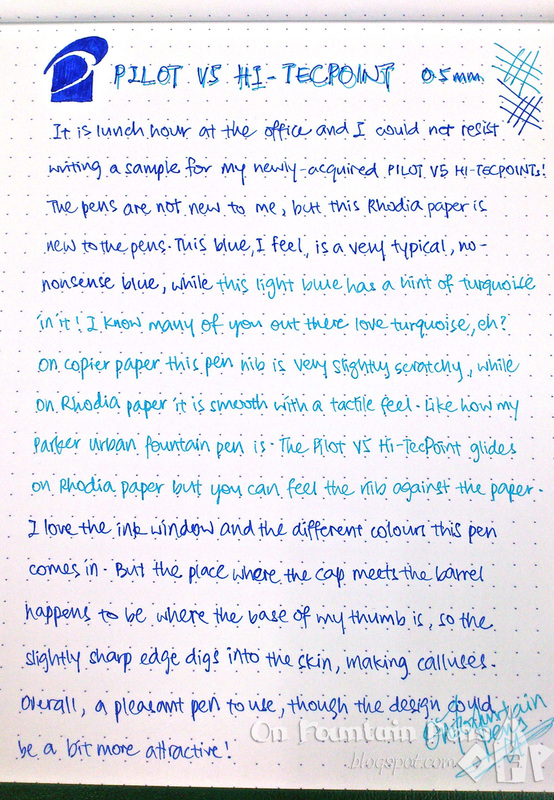 But on Rhodia paper, which is super smooth, the tactile feeling is more pronounced. Is this pen specially designed for commonly-used papers then? No line variation is exhibited with the pens. Which isn’t a big deal, since I wasn’t expecting line variations anyway. I’m sure most if not all of you have used or at least seen the Pilot V5 Hi-tecpoint before. If you haven’t, what a sinner you are! Go get yourself one now! Cult Pens sell them. They seem to sell any pen under the sun! And this pen comes in seven colours, just take your pick! I saw that Tiger Pens sell them too, and the description confirms my observation that the pen writes thinner than labelled. 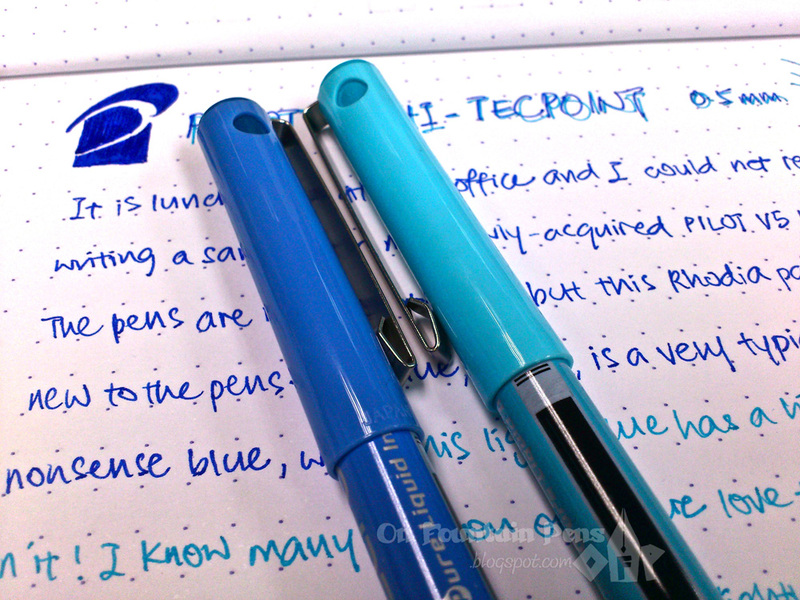 If you’ve used a Pilot V5 Hi-tecpoint before, how did you find it? Was it also one of your favourites before? I love this pen. I’m an author and usally use a Parker fountain pen, but when I’m travelling I prefere to use a Pilot v5 because I’m scared of ink leaks of fountain pens in airplanes. I can say this pen doesn’t make me miss my Parker! I have used the V5s since the early 1990s and I love the old design, not a fan of the new look Grip ones though or the Cartridge System V5s, the ink does not seem to flow as well as the old disposable pens. I too wished they did an orange V5, I’m sure I remember one years ago but it may be my mind playing tricks on me! Ooh, was there a different look that far back? Hi Mandy, thanks for the comment! It's great to know that, I'll be checking them out the next time I visit Popular bookstores! 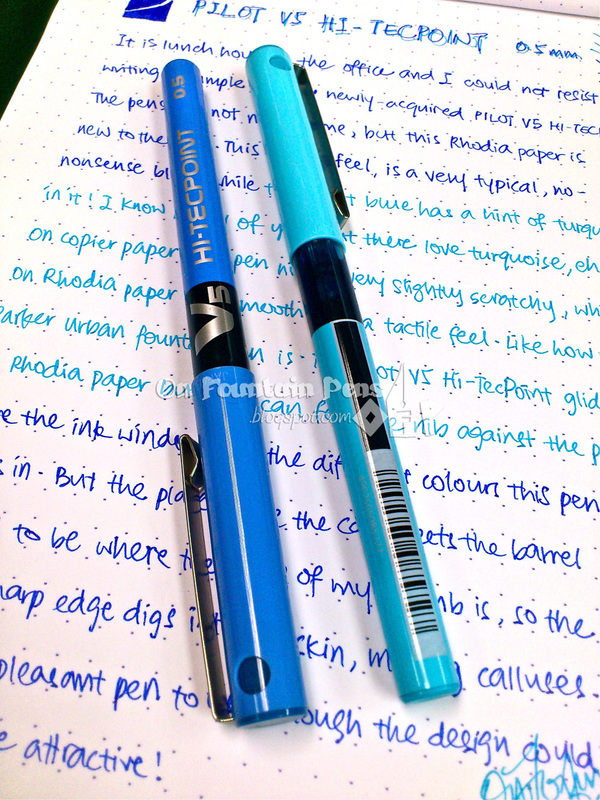 I didn't Know that they even have turquoise!Right now I just have the normal blue.You mentioned that u want it with refills?Here's a great news:They have refills for this ink,but,u'll need another pen casing for it.I have the one with refills and its not bad!It cost only about $2.45 at popular bookstore.Hope u like it! Hi Avinash, thanks for dropping a comment! Hmm I haven't really tried to solve such problems because I would just get a new pen! Could you try to let the dealer know, and try to get a refund or an exchange? If not, I would advise either one or both of the following: 1) cap the pen and drop it on the ground or give it a couple of flicks, see if it forces some ink out or not. 2) this is a little dangerous and I'm not sure at all if it would work, but I am guessing there might be something stuck at the nib, preventing the ink flow. Put the nib through a small flame for 1-2 seconds and see if it helps to melt whatever that is stuck there and release the ink! My pilot v5 grip is not writing since when i recieved it through flipkart……i havent even put a dot with it….it has ink in it..but not writing….wat to do..? Any one plz help me out.! Its my 1st pen in v5 series..
Hey long time user of this pen. Of COURSE there is a way-and as you said, yes it's a hack. See the blue 'nib' the entire tapering blue part made of rings. Get a pair of pliers and gently-VERY GENTLY but firmly pull it out. No doubt this process leaves tooth-marks on the barrel, but it exposes the inside. Not very ink can be filled in. Only the ink that is made for the simple 'Pilot® pen' coming for Rs10 per bottle is advised for refill. Half a bottle goes in. That way, the pen is very cost effective. But as with all Pilot®s this pen too is vulnerable to its ball falling off, so prevent it from falling. It is an improvement, though, over the Rs25 Pilot® as its ball goes off in the first fall itself. Hello Azizah, go get the light blue! I used the other colours before and they rock too! I just wish they have orange, the same bright orange as the Super Gel. It would be so much fun! Shangching, ooh, I didn't know about the old name. Thanks for the note. Yes, it should be sold everywhere, this pen. 😀 I'm sure there is a reason why it persisted over the decades! I used this pen ever since I was in elementary school. It was advertised as Pilot Precision V5, if I remembered correctly. Similar to you, I love how the ink just flows right out and it is one of my go-to pen while I was in uni. I found them mostly in uni bookstores, as well as large commodity stores. Very popular, especially if you like precision in writing! Great review! I LOVE these pens myself. They are one of my favorite liquid ink pens and they are always top-notch (not to mention mine have never dried out and they are like a decade old). The turquoise is very enticing… I only have green, pink, and purple in my current collection.